Keep Your Finger On The Pulse Of Your Organization! Company Pulse helps companies manage their greatest asset, their employees. Company Pulse provides a web based application to gather metrics on the happiness and wellbeing of employees and allows companies to compare the metrics with events inside of an organization to help gain a better understanding of how their actions affect their staff. User defined metrics allow companies to track what is important to their business and employees. 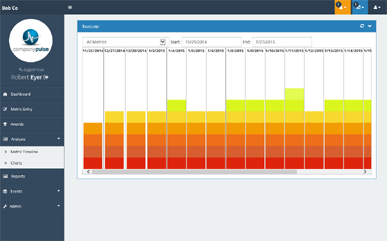 Metrics can be answered quickly by employees using an easy to use interface. 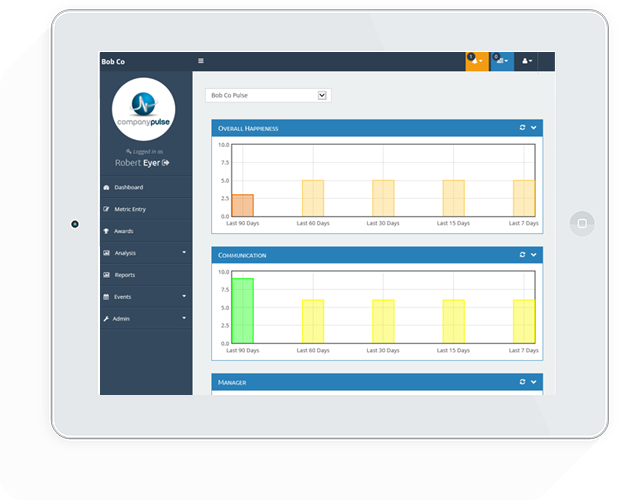 The dashboard provides management with company wide and department level real time information. Metrics can be further analyzed and compared to view changes over time. Employee recognition programs can easily be put in place using Company Pulse's awards programs. 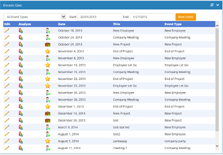 Awards can be setup to reflect the company's business and employee functions. Awards can be handed out by employees, management and external customers for a job well done. Rewards can be viewed inside the company as well as externally. Company Pulse launches its employee engagement platform. Email us at info@company-pulse.com and lets get started on making your company more effective and a happier place to work!